NEC America is pleased to introduce IntraMail, an integrated Voice Mail system specially designed for the DS1000 and DS2000 systems. AND, it’s available at a significant savings versus previous voice mail systems. 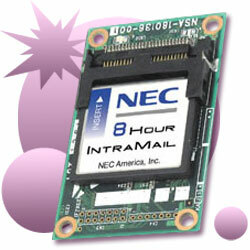 IntraMail is immediately available as a four port/four hour system and a larger eight port/eight hour system. IntraMail is truly an integrated system. It installs inside the common equipment saving wall space and AC connection requirements. Just plug in IntraMail, power up and your voice mail is ready to take messages. It’s that simple. Station ports aren’t required so it doesn’t reduce system capacity. Interactive "Soft" key prompts on Display Phones help users handle their messages. A flashing message lamp lets a user know that the IntraMail has a message for them. IntraMail also provides Auto Attendant, Multiple Greetings, Flexible Answer Schedules, Fax Detection, Answering Machine Emulation, Conversation Record and many popular voice mail features that let your customer get the most for their communications dollars. Full Integration - IntraMail installs inside the DS1000 or DS2000 common equipment, it does not require the optional expense of analog station ports for connection to the system and does not require a separate power supply. Message Alert - IntraMail will flash a message waiting lamp on your phone when you have a new voice mail message and will show the number of messages in your mail box. Interactive Voice Prompts - Full integration allows IntraMail to supply interactive voice prompts to key system users. For example, when an extension user dials an intercom number not in use, they will hear a voice announcement that says, "The number you have dialed is not in service." Interactive "Soft" Keys - One of the most useful aspects of the full integration is the interactive "soft" keys shown on display telephones which let you manage your voice mailbox without having to remember dialing codes. For example, to exit your mailbox after you've listened to your messages, simply press the softkey that says "Exit". Automated Attendant - IntraMail's Automated Attendant saves you and your customers time and money. Incoming calls are answered quickly with greeting messages that can change depending upon the time-of-day and/or day-of-week. Greeting messages can be tailored to provide callers with dialing instructions such as "Dial 1 for sales, 2 for service or stay on the line to speak with an attendant." Caller ID with Return Call - Busy offices can always keep pace. Since the Caller ID number is associated with the voice mail message (if Caller ID is supplied by your local telephone company), it makes returning calls to people who have left messages in your voice mailbox that much easier. Fax Detection - Without the need for a separate line for the fax machine, you can save even more money! IntraMail can listen for a fax tone on an incoming call and automatically transfer the call to the extension where your fax machine is installed. Conversation Record - Record a conversation into your mailbox, review that conversation later and forward it to another extension. Never again worry about forgetting important information.